This post contains the transcript of interview questions posed to Totak H. Clymes. The first book I ever wrote was a little short story in elementary. My second foray happened in high school, and both were inspired by a need to garner a good grade in Language Arts. Amissio Libra is my first work inspired by actual inspiration, and this time it’s for anything but scholarly achievement. Were it not for my bedmate, I would have never put the story to print. I’ve never had the pleasure of meeting any of the writers, scripters or artists who have inspired me in the past. Calling one out as a mentor might be a bit delusional. Having said that, the most read of the authors on my bookshelf includes Michael Crichton and Richard A. Knaack. Amissio Libra: Declina, graduating from yet another college…again, and nagging my live-in Agent to promote Chaos. Only if it pays the bills and keeps my family fed. Otherwise, it’s a semi-fulfilling, time-consuming hobby. Like my education. It would be shorter to list the number of things I knew going into the project. So aside from opening my laptop and typing until I can’t feel feelings, I had to learn nearly every relevant aspect of proper creative writing. Do you have anything specific that you want to say to your future fans? My unproductive, expensive habits thank you for your support. Oh, and I hope you enjoy the ride. I’ll try to at least make it entertaining and less frustrating to read than it was to write. They will all fall under Contemporary Fantasy. Eventually, I’ll need to fall back on some High Fantasy concepts as the world becomes less … there. But rather than inventing my own world, I’m destroying the one already here. I have also been informed that some of my rough material bordered on Absurdist, but I hope to rectify those areas before any official release. Too much and not enough. I try to be as accurate as possible when describing a place derived from reality, but there are concepts explored that might benefit from further investigation. For instance, Isa’s native language and proper phrasing, protocol for militarizing an entire country and proper order of operations in dealing with dynamic and unpredictable domestic threats. I also face particular difficulties in classifying my own rules for the interactions of Xi and Xan on the natural world. Somewhere along the line, I have to choose between being too accurate or too vague for the sake of consistency. What do you find most distracting while you write? Do you get writer’s block? What do you do to get through it? Every second of every day. I’d like to say I’m more stubborn than my WB, but that’d be a poor excuse for a lie. Time heals the bulk of the WB, reading or watching favored movies does the rest. The only surefire cure for WB is inspiration and the desire to “get to the good part”. I’ll have to re-check Google Earth. Jest aside, the book centers on characters entirely fictional in an opening setting of equally fictional origins. Roma and Saikah’s home are based on places I have seen firsthand, but both were in other locales. Unless I’m mistaken, I’m almost entirely sure that Seattle is the only other major setting of the novel. That part is real. There are several underlying themes but no real moral message. On the other hand, one of those themes is the blurring of the lines between the predefined notions of good and evil. Starting out, I have to lay down the line in order to scrub it away later. I hope readers enjoy the journey in the interim. 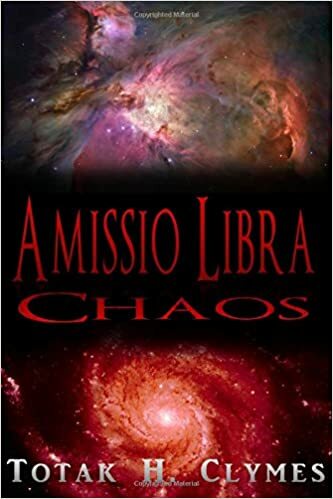 This entry was posted in About the Author and tagged Amissio Libra, Chaos, Contemporary Fantasy, Interview Questions, Totak H. Clymes, writing. Bookmark the permalink.